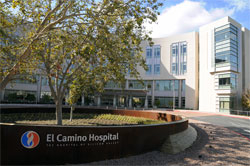 El Camino Hospital, Mountain View, Calif., home to the Genomic Medicine Institute, opened in November 2009. Step into the gleaming lobby of the brand-new El Camino Hospital in Mountain View, Calif., and you might hear a harpist or a pianist playing nearby. Walk over to the information desk, and a touch-screen computer can guide you to your destination inside the 460,000-square-foot hospital. Roam through the wide, sun-filled hallways and you will likely pass a “tug” robot—akin to a smart minifridge on wheels—busy carrying supplies between units. When checking in, you will be asked to place the palm of your hand on a scanner, so the computer system can identify you and sync up your inpatient medical records and insurance information. Visitors will see many things at the $480 million, 300-bed hospital, which opened in November 2009. What they won't see is perhaps the hospital's most ambitious project, its Genomic Medicine Institute. The institute is happening virtually, and at the bedside, with the hope that patients will be able to benefit from groundbreaking new bioscience technologies, especially in personalized medicine, many of them in development a stone's throw away in Silicon Valley. Twelve years ago, the Food and Drug Administration approved Herceptin and the companion HER2 test developed by Genentech, of South San Francisco, (now owned by Roche) to diagnose and treat a certain type of breast cancer tumor. Herceptin was the first tailored cancer drug and was supposed to usher in a new era of personalized medicine, matching patients to targeted treatments, and even identifying a person's susceptibility to disease to tailor preventive therapies. While this has yet to happen on a large scale, many biotech companies, investors, providers and big pharmaceutical giants remain bullish on personalized medicine and have jumped into the field. The U.S. personalized medicine market is estimated at about $232 billion today, and is projected to grow annually by 11%, to more than $450 billion in 2015, according to PricewaterhouseCoopers. The mapping of the human genome and rapidly developing genetic technology and diagnostic tests have fueled the growth of personalized medicine. President Barack Obama has described personalized medicine as the right treatment for the right person at the right time. Despite a deep recession and dragging capital markets, the biotech industry in the U.S. raised a record $55 billion in 2009—through public and private partnerships and financing, according to Burrill & Co., a life science venture capital and banking firm in San Francisco. The mapping and sequencing of human genetic material, completed in 2003, cost nearly $4 billion and took 13 years, through the U.S. Human Genome Project. The federal government has since been licensing technologies and awarding grants to the private sector, which is eager to sequence individual DNA at an ever-lower cost. Today, some companies say they can do it for under $20,000. The Archon X Prize for Genomics, a contest launched in 2007, is offering $10 million to the first team to sequence 100 human genomes in less than 10 days for less than $10,000 each. New funding includes $10 billion over two years to the National Institutes of Health under the American Recovery and Reinvestment Act of 2009 for biomedical research. As blockbuster drugs go generic, large pharmaceutical companies see an opportunity in personalized medicine. “We want to be blockbuster-ready, not blockbuster-dependent,” says Andrew Witty, CEO of GlaxoSmithKline. He was speaking at the J.P. Morgan Healthcare Conference in San Francisco last month. Major pharmaceutical companies are moving away from “little white pills in Western markets,” Witty says, with more of a focus on targeted products. Speaking at the inaugural Personalized Medicine World Conference last month in Mountain View, Weiss gave the example of statins, a group of drugs that lower cholesterol and a very profitable sector for Big Pharma. To be sure, few drugs are available today that fulfill the promises of personalized medicine. Pfizer has one HIV drug on the market called Selzentry, or maraviroc, that was approved by the FDA in 2007 in conjunction with a diagnostic test. The test confirms that the eligible patient has an HIV strain that attacks a certain receptor. The drug then blocks that receptor, so the virus is unable to enter immune cells. Diagnostics is a hot area of personalized medicine. The molecular diagnostics market is expected to grow 14% annually to $5 billion in 2012, according to PricewaterhouseCoopers. Myriad, an 18-year-old company, last July spun off its pharmaceutical division into a separate company and renamed itself Myriad Genetics to focus on personalized and predictive medicine. Among the Salt Lake City-based company's programs are individuals' drug responses to chemotherapy and predictive tests for colon and pancreatic cancer. Although Myriad and its competitors say they are confident that insurers, Medicare and self-insured employers will ultimately pay for such testing, that too has been slow in coming. Lynn Dowling knows this all too well. A longtime hospital business development consultant, Dowling was diagnosed with breast cancer in 2005. Under American Cancer Society guidelines, Dowling's best course of treatment was chemotherapy. But she began researching chemotherapy's harsh side effects, both short- and long-term, and decided she wanted to avoid chemo if at all possible. She heard about a test developed by Genomic Health, a Redwood City, Calif.-based pharmaceutical company. Called Oncotype DX, the test can help predict whether a breast cancer patient will benefit from chemotherapy by examining the tumor tissue at the molecular level. The test can also predict risk of recurrence. Dowling's insurance company wouldn't pay for the test, which at the time cost $3,500. But she thought it was well worth the price out of pocket. Her test results indicated that she had a low risk of cancer recurrence, and that chemotherapy would have no extra benefit. Her 10-year survival rate was 96% if she just took the breast cancer drug tamoxifen. If Dowling chose tamoxifen plus chemotherapy, her 10-year survival rate would rise to 97%, she says. Five years later, Dowling says she is in perfect health, and estimates she saved her insurance company $50,000 in chemotherapy drug costs by paying for that $3,500 test. In 2007, the American Society of Clinical Oncology included Oncotype DX in its clinical guidelines on the use of tumor markers for breast cancer. Genomic Health last month launched a similar colon cancer test. As for Dowling, she became a convert to personalized medicine, and began looking for a hospital in the San Francisco Bay area to launch a program. “I started running around like Paul Revere, shouting 'Genomics is coming! Genomics is coming!' ” she says. Dowling was turned down by several other health systems, and her search led her to El Camino Hospital. She now serves as a consultant to the hospital's Genomic Medicine Institute. But she recognizes that the hospital must show a return on its investment. Under the program, hospital patients and their families can get free genetic testing, and participate in genomic research. The hospital is not seeking payer reimbursement for these services. El Camino has partnered with DNA Direct to provide testing and genetic counseling to patients. DNA Direct, based in San Francisco, is also partnering with managed-care company Humana to provide genetic counseling to targeted members. At El Camino, physicians can refer their patients for genetic counseling, and use available tests to help clinical decisionmaking. Because it is in the heart of Silicon Valley, El Camino hopes to attract partnerships with other companies engaging in personalized medicine, and become a beta test site for companies developing new technologies. Other health systems across the country are also diving into personalized medicine, including Oakland, Calif.-based Kaiser Permanente, which is creating its own genomic databank. Geisinger Health System in Danville, Pa., has launched MyCode, a personalized medicine project, and is linking members' genomic information to its electronic health-record system. Both Kaiser and Geisinger are integrated systems. Still, providers face a steep learning curve in this field, and reimbursement is far from ensured today. It won't be pharma companies or providers that lead the way in personalized medicine, Levy predicts. Companies outside of healthcare could be formidable players—such as Nestle, PepsiCo, Procter & Gamble Co. and Wal-Mart Stores—because of their vast experience targeting consumers and focus on the wellness market. PricewaterhouseCoopers advises providers to partner with experts in personalized medicine and adopt electronic health records to support further advances in the field. The upside could be tremendous, Levy says.